In Kansai region, blossoms of Someiyoshino are over but late blooming multiple-petaled cherry blossoms are still lingering. Let me get the clock back to about ten days ago when I viewed Benishidare at Heian Shrine after walking the Philosopher’s Path. 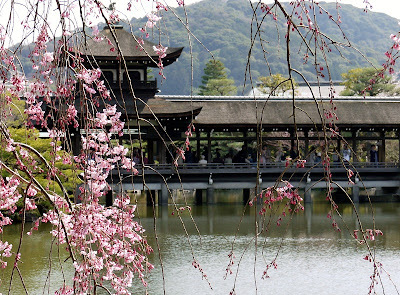 Heian Shrine was founded in 1895 in commemoration of Kyoto’s 1100th anniversary. It is a Shinto shrine dedicated to the Emperor Kammu and the Empeor Komei, the founder and the last emperor of the Kyoto Capital respectively. “Heian” is the ancient name of Kyoto which literally means “peace and tranquility”. “Shin-en”, the sacred gardens of the Heian Shrine, consists of four gardens. 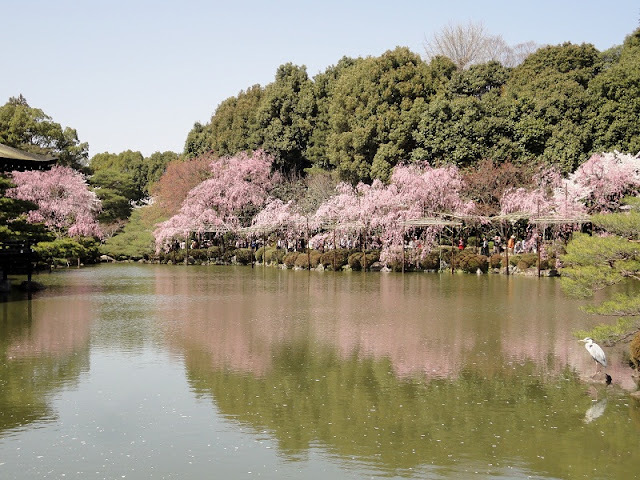 In spring, the major attraction is 紅枝垂桜 Benishidare cherry blossoms in the South and the East Garden. 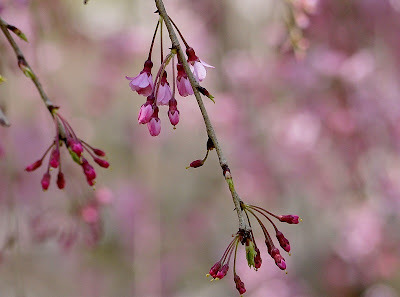 Benishidare bloom crimson-pink flowers on many long-hanging twigs. Many of Benishidare at the shrine is double-flowered. The moment you enter the South Garden, you'll be overwhelmed by the huge crimson-pink flowery parasols spreading over the ground. 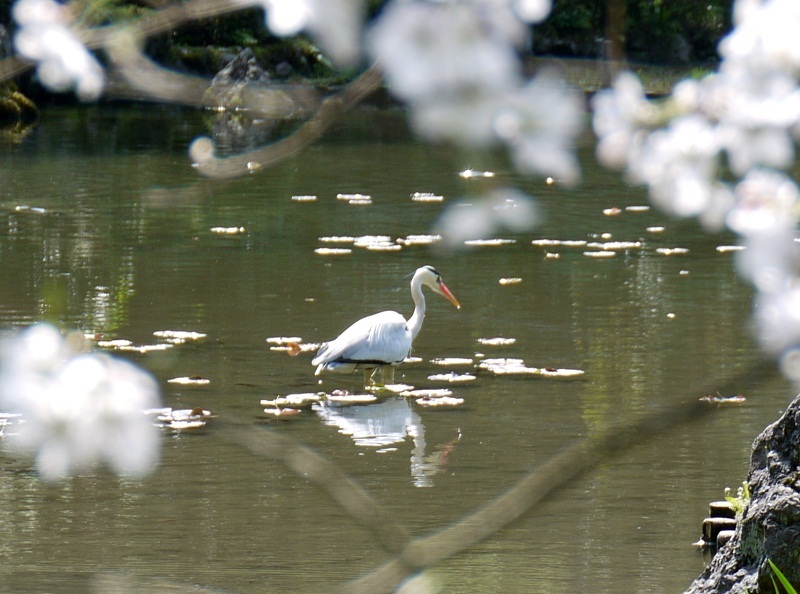 ・・ and in the pond. 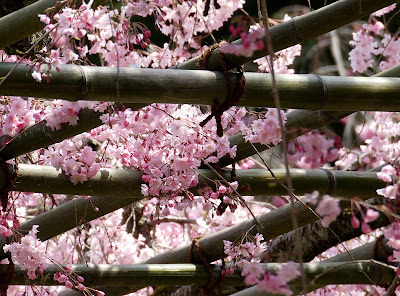 Many long branches laden with blossoms are supported by the massive trunks and by the lattice made of bamboo as well. Moving to the East Garden, pale-pink Someiyoshino welcomes you. 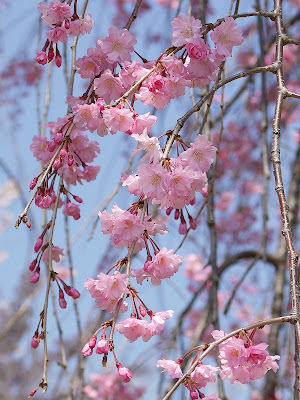 They are by far the most numerous variety in Japan and bloom and fall within a week, while Benishidare last two weeks. 栖鳳池 Seiho-ike Pond is the center of the East Garden and two buildings formerly located on the grounds of the Kyoto Imperial Palace stand along the pond. One of the two, 尚美館 Shobi-kan, is a guest house for VIPs and special events like a wedding. It is a cypress bark-shingled wooden structure. Shrine maidens are making previous arrangement for the wedding. Flowers were glinting off the light. The other structure, 泰平閣（橋殿）Taihei-kaku bridge across the pond serves as a gazebo on the water. It is a cypress bark-shingled wooden structure, too. This is a view from Taihei-kaku. The heron might be mesmerized by the dazzling pink. 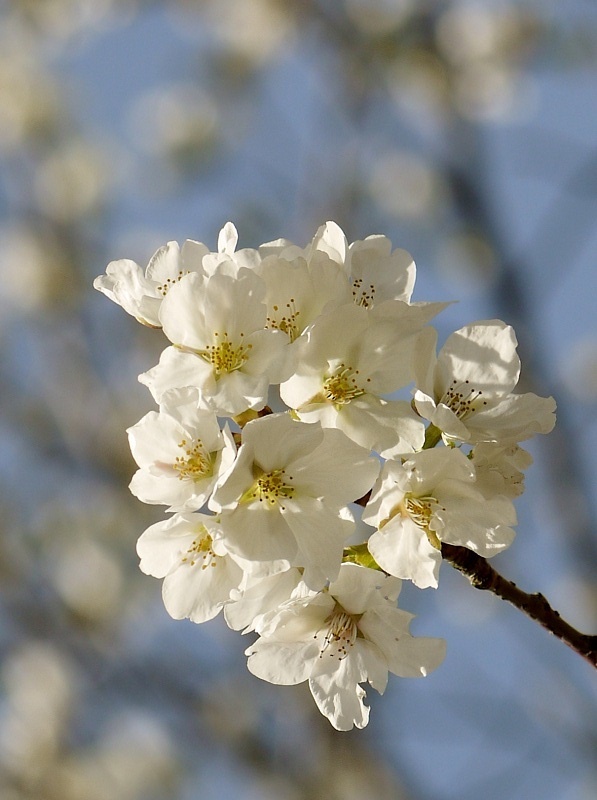 After leaving Heian Shrine, I found pristine white cherry blossoms at the park in front of the shrine. 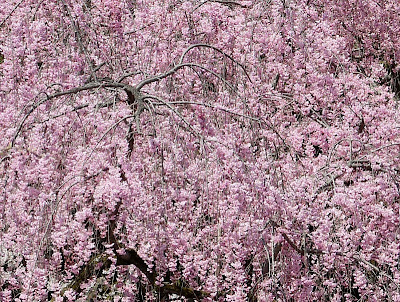 Being so familiar to the blossoms of shades of pink, the pure white blossoms looked so fresh. 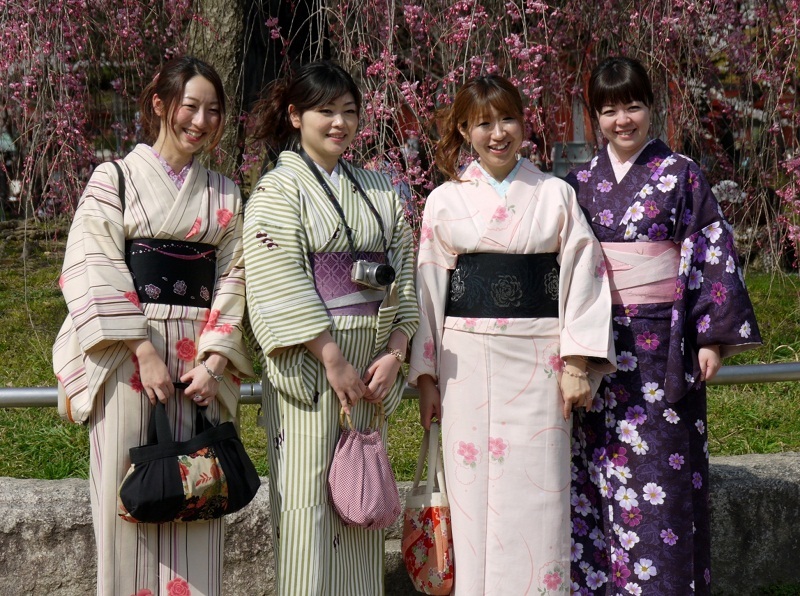 And, young ladies dressed in kimono, too. The photo of a sightseeing boat on Okazaki Sosui Canal was taken while I was heading for the nearby Kyoto Subway station. The threads of weeping willows were getting longer and greener. 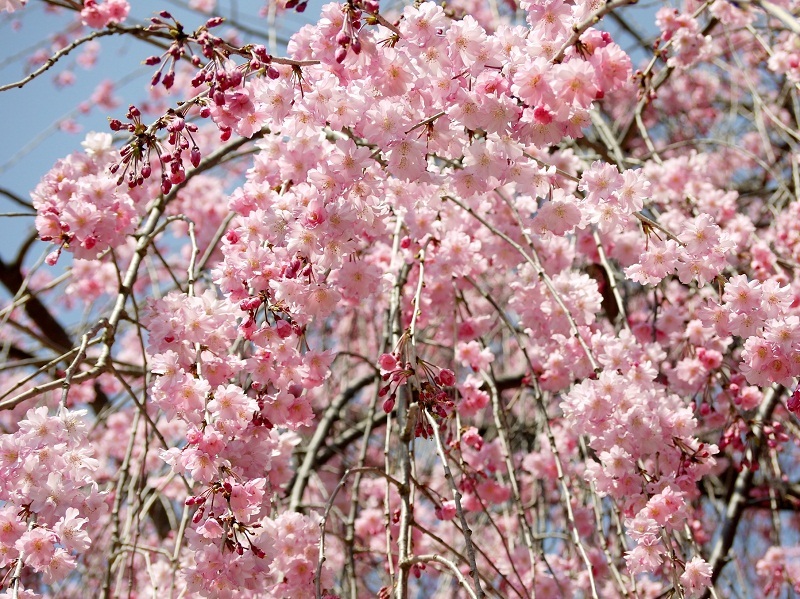 The masses of cherry blossoms are an absolute dream! The temples and kimono clad young ladies enhance the effect. A joyful post. 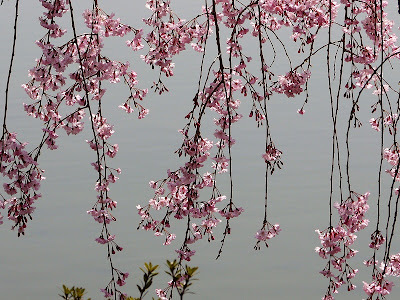 Soft muted pinks reflected in the pool and a curtain of golden weeping willow to peep through -lovely images Yoko. Såååå vackert jag blir alldelens stum. Får nog försöka mig på en res dit i dina trakter. Tack för din fina text och dina otroligt vackra bilder. Oh goodness - each shot is a work of art. What a magical world! just an amazing sight! any number of these photos would make glorious enlargements! Thank you, Yoko, for sharing the "peace and tranquility" with me. From shades of pink to pure white, all are so lovely. As my world is cold and covered in snow, I think I'll linger in yours. 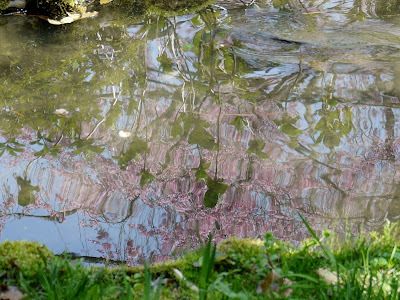 My favorite picture in this series is of the pink blossoms reflected in the pond, stardust. 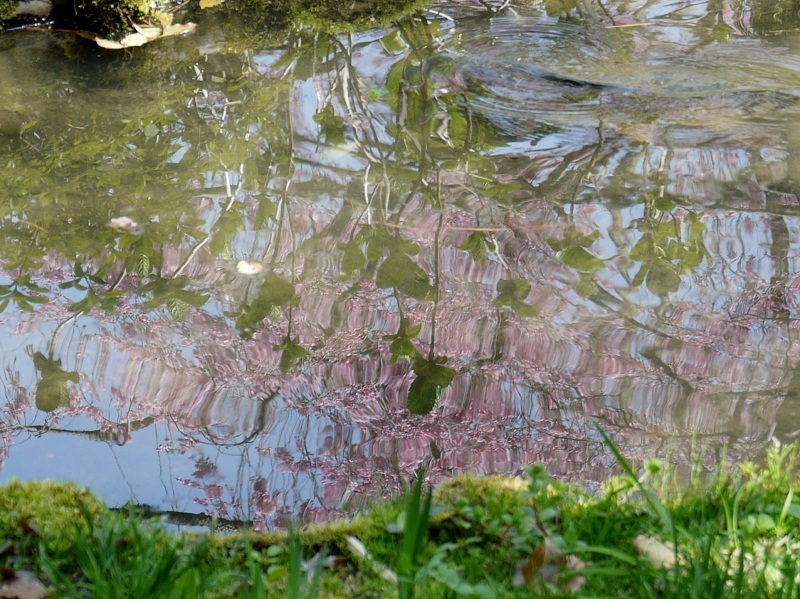 We have blossoming trees in my part of the world, too, but rarely are such sights nestled so closely to the ponds. Thoughts of emperors gone by and the lone bird scanning the scene add a touch of history and serenity. Cudowne widoki pięknie kwitnących drzew wiśni. Miło było pobyć w tak pięknych miejscach i zobaczyć ponadto dziewczyny w kimonach. Pozdrawiam serdecznie. 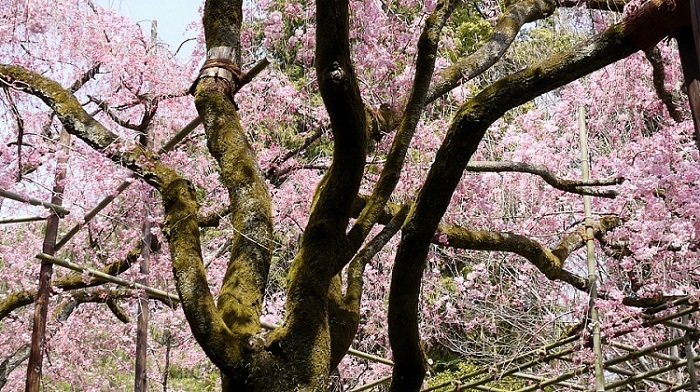 Wonderful views of beautifully blossoming cherry trees. 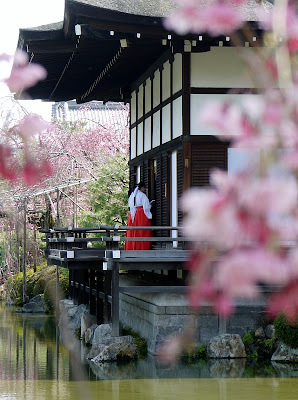 It was nice to stay in such a beautiful place and also see girls in kimonos. Yours sincerely. BTW, the first photo is awesome! Is it rare to see ladies in kimono these days? Thanks for keeping tuned with my posts. 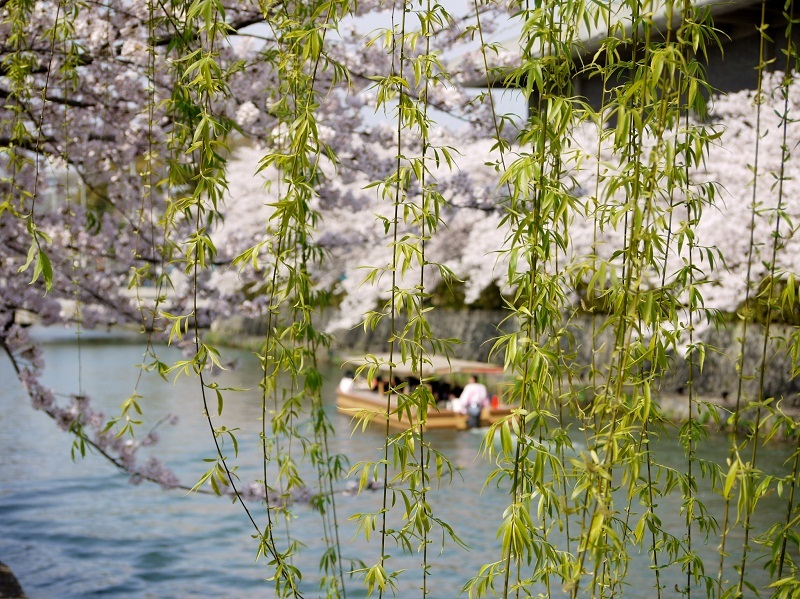 If you are after beautiful colors and fresh green foliage, spring would be the best. Autumn is also fabulous for the colored leaves and refreshing cool and crisp air. Wearing kimono has gotten fashion trend among the young ladies when they stroll around historical sites . They wear either their own or mostly rental kimono. There are rental kimono shops with reasonable price including renting kimono and dressing in Kyoto or Nara. There are men renting traditional clothes for a stroll, too. Son unas fotografías maravillosas. Tienes retratada a la primavera en todo su esplendor. 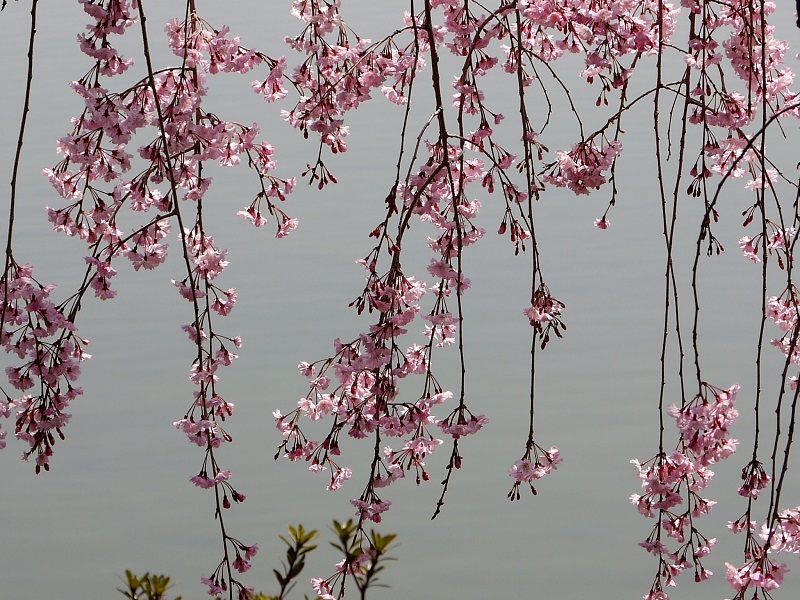 Such delicate blossoms and photos. The ladies in Kimonos are so beautiful. Your marvelous spring images really make me smile! Thank you for sharing so much beauty on your blog. Gorgeous blossoms, both the rich pink and pale pink varieties. 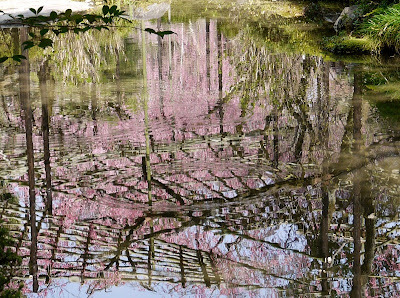 The reflections in the water are beautiful, what a glorious place in the springtime. 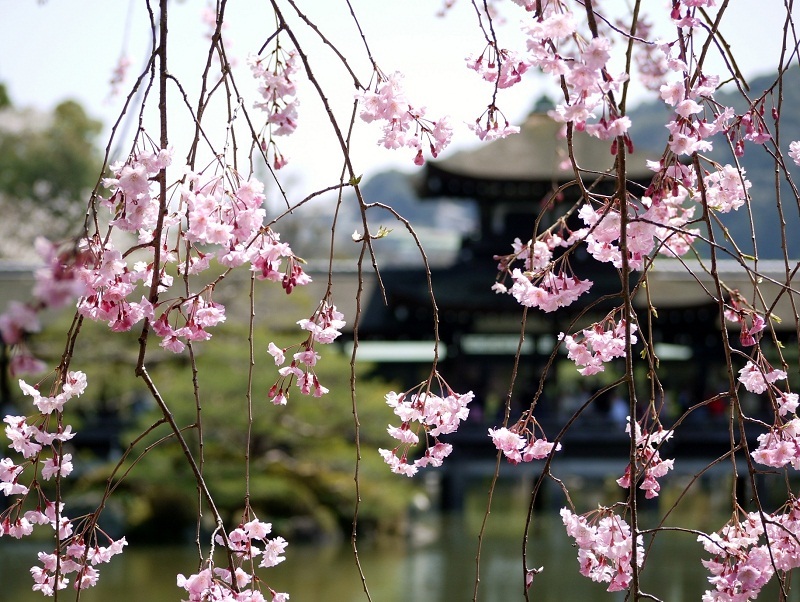 What impresses me most is not only the marvellous bloom of your cherry trees, its additionally the impressive background like the ponds, the ancient buildings and harmony of the whole ensemble that makes a perfect picture. One time in my life I have to travel to Japan during your hanami season. Thanks for sharing your fantastic photos, Yoko! What a paradise! Such beauty is overwhelming. How do you deal with it all. It would take my breath away. Is there a place to stay at this shrine or is it to be visited and left all in one day? And I learned the ancient name of Kyoto - that's fun! Your photographs are delicious...the blossoms do look good enough to eat! I think this would be a sublime place to spend time in the renewing of one's soul. BTW, my wife is doing quite well. The surgery and its aftermath was relatively smooth. The best thing was that the bladder, etc., were biopsied and no further cancer was found! Re your comment about the "war on Christmas": We have many foolish and stupid people here who claim there is a war (by "liberals") on Christmas. That is so far from the truth as to be laughable. My point is that Jesus was a Jew and Christmas is not something he would celebrate but rather he would celebrate the Jewish holiday, Hanakkah. Did you know that the birth of Jesus was not celebrated by the Christian church until the 4th century of the Common Era? It wasn't thought to be important plus no one had a clue when he was born. The birth stories are fictional, borrowed from other savior-god stories, such as Mithras, who was born on December 25, in a cave, surrounded by animals and shepherds and whose mother was a virgin! But you are right. If one takes the first three gospels to be true in some sense, that Jesus portrayed in those stories is usually seen as welcoming all peoples and groups. Not always, though. In Matthew, he says he was sent only to his own people, and sends his disciples out to share his message to the Jews. Hope that all goes well with your and with your family. 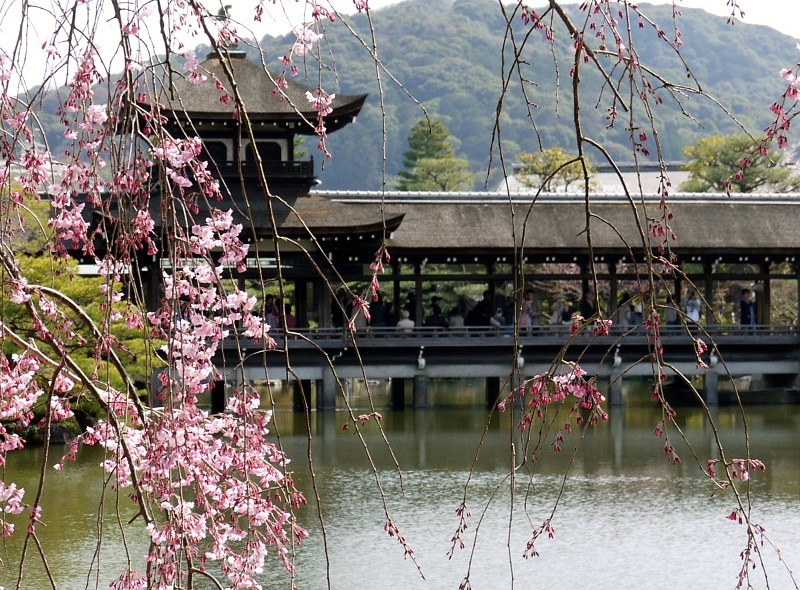 Half a day would be enough to stroll around leisurely the Heian Shrine. 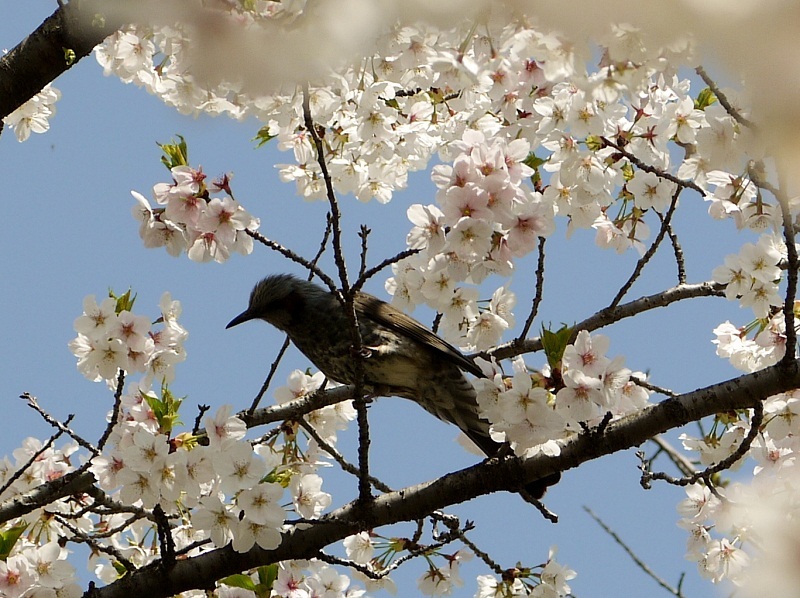 There are many other nice sites to visit and nice accommodations in Okazaki district where Heian Shrine is located. Now I understand what you had in mind when you wrote the poem. I had thought Jesus was a Palestine but being a Jew would be more accurate. Jesus was a Jew and Jewish people are thought to be forsaken - this is a great paradox. I've learned many of Christmas traditions date back to pagan cultures before Christ. I'm happy for you with the news that no further cancer was found. Thank you for letting me know it. Weekend, and I'm catching up with everyone. It's always such a pleasure to return to your blog. 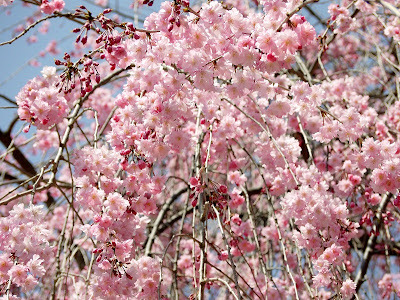 These blossoms are gorgeous! 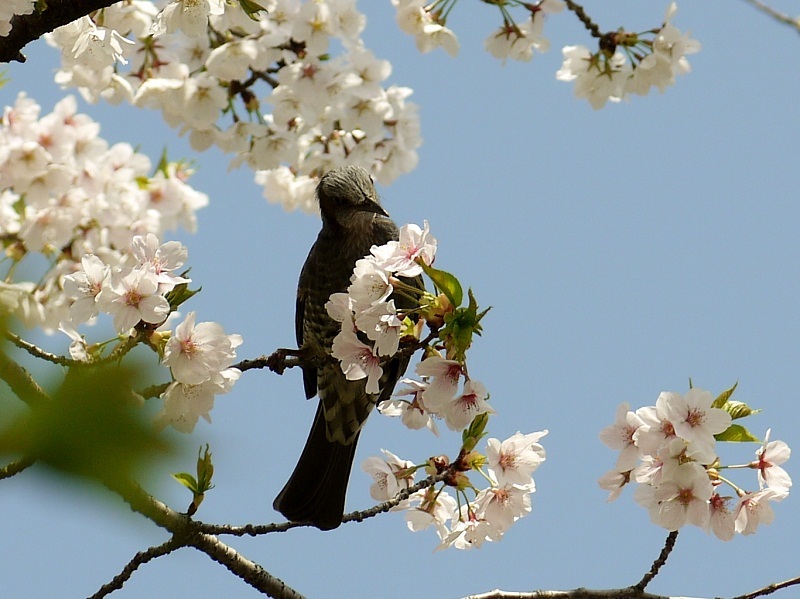 So much more beautiful than Yoshino blossoms, don't you think? Benishidare looks more brilliant, but it’s difficult for me to compare Benishidare with Somei Yoshino as each has beauty of its own. 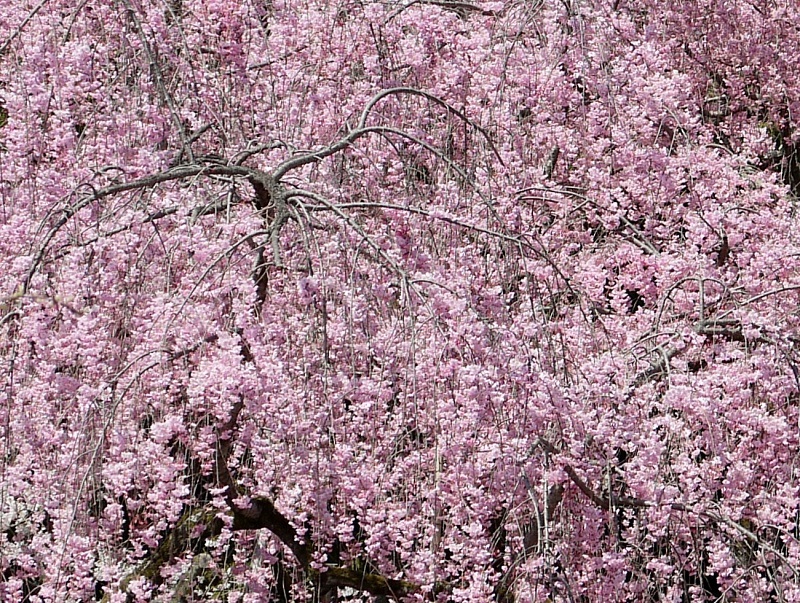 If I have to choose one, I’ll go for mountain cherry blossoms. 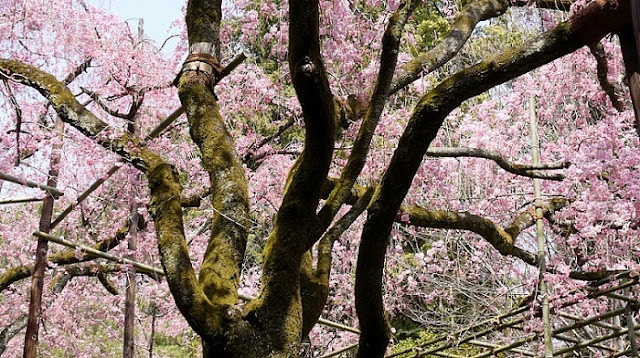 Currently dogwood blossoms are in full bloom and wisteria as well as azaleas have started blooming earlier than usual here in Nara. All pictures are inspiring, and the two with herons are sen-sational! I wish a wonderful week to you, Yoko and your little birdies! 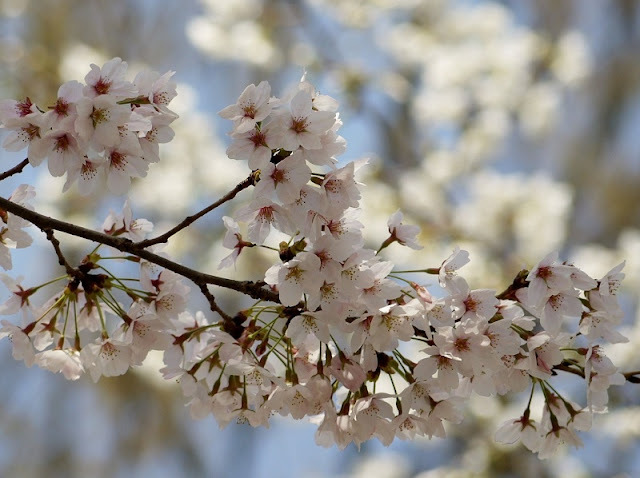 I've been to Japan during the sakura season and I know that the magic of the sakura as protrayed in your photos is absolutely true. I like the first and the last photo best as they show the different depths of field (DOF)so well. 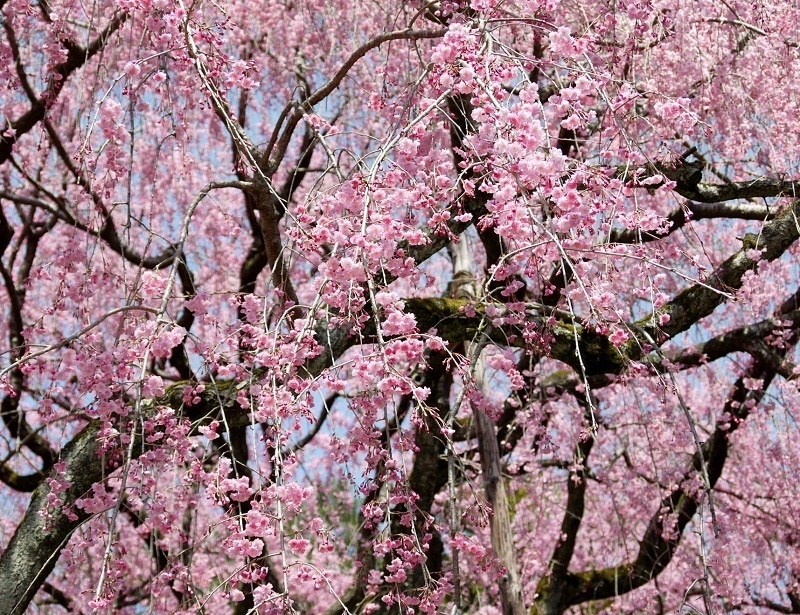 If someone asked me what colour represents best Japan I would definitely say pink! I don't know how Japanese people would answer such a question, but for me it is pink. And last week, when trees have finally started blooming in our city as well, every time I saw pink inflorescence I thought of you, Yoko. I'm happy you are enjoying spring and have time to visit special places like this one.